How to Use The Photoshop Action Panel? When you find that you do the same task over and over again in Photoshop, you should consider creating a Photoshop Action to do the hard work for you. This can save you a lot of time and give you more time to take photos instead of processing them. Alternatively, consider buying a set of ready-made actions, which cover your needs. You can take a look at these Photoshop Actions for Photographers, which makes using some of the most useful Photoshop functions and routines into a matter of simply click-and-forget. A Photoshop action is just like a recorder, that keeps track of all the changes and modifications you apply to a particular image. This could be adding sharpness, changing a color or exporting your image in a specific format and size. When you record the actions you do, you can “play them back” on another image to quickly apply the same functions and settings on the new image. It can be a real time saver both when it comes to performing repetitive tasks that consume a lot of time, but also, when it comes to tasks, that you don’t do very often and therefore tend to forget. Even quite simple tasks can take a long time if you have to search for the right solution because you forget how to do it. However, if you have created a Photoshop action of how to do it, you only have to remember to find the action and run it. Using Photoshop actions don’t require any other knowledge or technical insight other than what you find on this page and knowing how to perform the functions you want to record as actions. This is why I love them. You don’t need to know how to program different scripts to automate even complicated tasks in Photoshop. Basic Buttons in The Photoshop Action Panel? Before digging into recording your own action let us take a look at the Action Panel in Photoshop. First of all, let’s be sure that you have the action panel visible in Photoshop. You can show or hide the action panel by pressing the F9 key or use the menus: Window >> Show Actions. Now let us take a look at the different buttons at the bottom of the Photoshop Action Panel. All of the commands activated by the buttons can also be accessed the Action Panel Menu if you prefer this way. The main buttons of the Photoshop Action Panel (from left to right you have the buttons): Stop / Record / Play / Create New Action Set / Create New Action / Trash. Photoshop actions can only exist within a folder, which is called an Action Set in Photoshop. This also helps you keeping organized, especially if you plan on using Photoshop Actions a lot. So you need to create your first Action Set where you will put all your Photoshop actions. Hit the folder icon at the bottom of the Action Panel to create a New Set. In the dialog type a name for the set that tells you that this is where your own Photoshop actions are stored. Quick tip: If you use the Alt key (Win) or Option key (Mac) when you click on the New Set button, you will skip the dialog and go with the default name. You can always rename the set later by double-clicking on the name. To create a new Photoshop action click the New Action button (looks like a page icon, and you will find it next to the trashcan icon). The New Action button will open the New Action dialog, where you can give the new Photoshop action a Name and assign it to an Action Set (which we will cover later). You can also assign a Function key or key-combination. Finally, you can also assign a color to the action, but this will only be visible in button mode. Note to modify a previously recorded or imported action; you need to select the action and click the Record button. Photoshop will then append the steps you record to the currently selected action. If you instead of choosing a whole action, select a specific step within an action, Photoshop will insert new steps or commands after the selected action step. Quick tip: It will often happen that you make small mistakes when recording your actions. Don’t worry. You don’t have to start over again, but only need to find out where you’ve made the mistake and correct that. You can “re-record” the settings for a command quickly by double-clicking on the specific action step you want to modify. If a dialog window is available for the particular command, it will open and allow you to adjust the values. Choose OK to save the changes or Cancel to stay with the original settings you recorded. After finishing the steps you want to include in your action, you can stop it by using the stop button. Otherwise, it will continue to record everything you do in Photoshop until you press stop. Press the Stop button to end recording or end playing an action that continues to run for a long time, which you for some reason want to cancel. You can also press the Esc key instead of using the Stop button in the Action Panel. If you at some point need to pause the recording you can also use the Stop button and when you are ready to continue just hit the record button to finish recording your Photoshop action. How to Play/Run your actions? After recording your action in Photoshop, you will at some point want to run it, i.e. on another image to get a similar effect or treatment. You can play an action by selecting an action and pressing the Play button. If instead of selecting an entire action, you choose a single of the sub-steps and hit the Play button Photoshop will begin running the action from the selected step and run until the last action step in the action. Quick tip: If you only want to play a single action step hold down Cmd (Mac) or Ctrl (Win) and double-click on the particular action step you want to run. How to Delete a Photoshop Action? If you want to start over with creating a Photoshop action or simply want to delete an action that you never use, and want to keep your actions organized, you just need to select it and press the trash-can icon/Delete button located at the bottom of Action Panel. If you only want to delete a particular step or several steps within a Photoshop action, you can select the relevant steps and press the delete button. You can also left-click on the action or action steps and drag it onto the trashcan to delete it. Now that you know how the basic of how to work with actions like recording, modifying and running them, you can begin to learn more advanced uses of Photoshop Actions. How to Use Modal Controls in Your Photoshop Actions? In some cases, you want to have full control of what a particular step in the action does. To be able to modify the settings used by a Photoshop action, you can enable the command’s dialog window to appear. For instance, you might want to play with the gradient bar, when running an action that applies a Sephia effect to your image. In that case, it makes sense to enable the modal dialog for the step that applies the gradient map command. By default, all dialogs are disabled for actions. However, you can easily enable/disable the modal dialogs by toggling the small dialog icon in the left side of the Action Panel. You can enable the command dialog for a whole action set, an action with all steps within it or just a particular step depending on where you toggle the modal control on/off. When the Action Panel shows an empty box, it indicates that modal dialogs for the action/step is disabled, and the Photoshop action will go with the standard settings used when recording the action. When you toggle on modal dialog, it is indicated by a white modal control icon. Note: a red modal control icon shows you that some (one or more) dialogs are enabled within that specific action. In some cases, you might also encounter a gray modal control icon, which usually means that modal controls are enabled, but that the step, action or action set is set to be excluded from playback. How to Exclude Action Steps From Running? If you want to skip a particular action step within an action, you can exclude it by toggling off the checkbox to the far left of the action step. Excluding a step will remove the checkmark icon for the action step and make a red checkmark icon appear for the parent action indicating that one or more steps within the action are excluded from running. For instance, you may have an action that does several things, where one of the commands is applying an overall sharpening to the image. If your image has a shallow depth of field that you want to preserve, you might not want to apply an overall sharpening, but instead, apply it locally afterward. Then you can disable the sharpening step to avoid it being applied to this image. Just remember to include the step again after you are done using the action. To give instructions to the user before continuing with the action you can insert an action step called a stop. When Photoshop runs an action which includes a stop step, Photoshop will pause the action and display a custom message to the user. This message could tell the user, what to do next before hitting play to continue the action at the point where it left. You can insert a stop command in your actions by using the Action Panel Menu and chose Insert Stop… This will bring up a dialog window where you can enter a message to display when the action encounters this stop. The message should tell the user what to do next. You might want to remind the user to press play again after doing the manual work you ask him/her to do, in order to continue the action. Below the message you can tick a checkbox to allow the user to continue directly instead of stopping the action and doing things manually. a default Photoshop tools like the pen or brush tool are not recorded in your Photoshop actions. However, if you go to the Action Panel Menu and scroll down to the middle you will find the option Allow Tool Recording. When Allow Tool Recording is checked each stroke with the brush or pen tool will be added in your recorded action as an action step. How to run Photoshop actions based on certain conditions? Finally, you can make Photoshop run other actions within your action set if certain criteria is met. For instance, if the current image is Square you can run an action that does something (or choose not to run an action). If else you tell Photoshop to run an action that you already made that will crop your image into a square format. In this way, you can make ‘chains’ between your Photoshop actions to ensure your images get the treatment you intend with the Photoshop actions you create. You don’t need to use this option, but it can become useful in certain situations. You can access this option from the Action Panel Menu: Insert Conditional… In the dialog that appear you first have to set the criteria you want to test for. 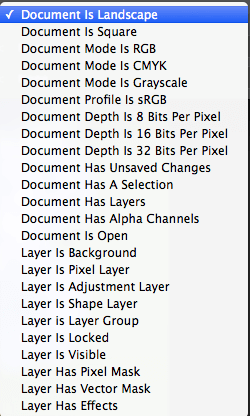 Below you can see the full list of criteria that Photoshop can test against without needing to make an advanced script. For instance, you can test whether the current layer is a background layer or if the current document (image) has an active selection and so on. After choosing the criteria, you need to specify which action (or none) to run if the image meets the condition, and what to do when the condition is not met. I hope this quite extensive guide to the Photoshop Action Panel helps you create some amazing Photoshop actions.